Snow crab with avocado and cucumber. Local Hawaiian ahi with cucumber and avocado. Albacore tuna with cucumber and avocado. Local wahoo with cucumber and avocado. Local ahi spiced with cucumber. Yellowtail, tuna spiced with cucumber. Cucumber wrapped in nori wrapped in rice. Tempura shrimp with cucumber, avocado with spicy mayo, unagi sauce, Tobiko and tempura akes. California roll topped with chef selection of sh. Salmon, cream cheese, jalapeno, avocado, tempura fried, topped with unagi sauce and tobiko. 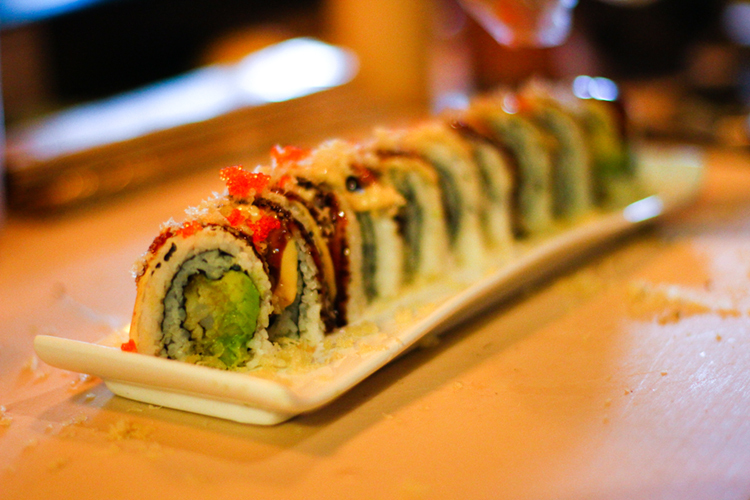 Tuna, ono, avocado, tempura fried, topped with unagi sauce and wasabi ginger ponzu. Soft shell crab, with local avocado, carrots and cucumber. Crab, cucumber, avocado, topped with premium tuna, drizzled with wasabi ginger ponzu, green onion oil. Tempura shrimp, cucumber, topped with spicy ebi, avocado, tempura akes, tobiko, unagi sauce. Tempura shrimp, cucumber, avocado, topped w/ salmon and seared w/ a spicy dynamite sauce. Spicy tuna, shrimp tempura, and cucumber, topped with salmon,avocado, tempura akes and sweet and spicy sauces. Spicy Ahi, tempura zucchini, cucumber, avocado topped with ono and thinly sliced lemon, ponzu sauce an green onion. Soft shell crab, cucumber, avocado and carrot topped with hamachi and thin sliced jalapenos. Slightly dry, exceedingly smooth and full bodied. With a rich texture and huge bouquet. Light and refreshing. Crisp and assertive with herb & spice undertones. Full bodied flavor of anise & papaya. The rich texture has a lush sweet finish soft & velvety. A roughly filtered, uncut dessert sake brewed in the traditional manner. Sweet & unusual in flavor. A sweet & light unfiltered sake. Soft, honey laced nose with just a drop of fruitiness. Delicious, smooth, full, light & crisp. A prominent fragrance. A clean fresh taste - with flavor deep into the recesses. Truly the “Rolls Royce” of Sake. Warning: this beer can make you do stupid things with class. Sealed with a cork & served in it’s own special glass.